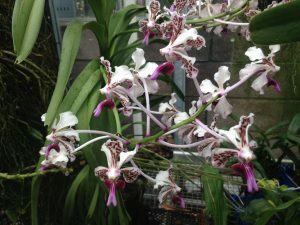 This grand orchid is native to lowland forest in Java and is clearly determined to become a giant orchid over time. 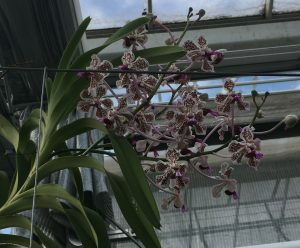 The plant produces stiff alternate leaves 30cm long and then long spikes of flowers – the plant has four spikes out today – each with at least ten large and very fragrant flowers. The plant is loving life in Warm Asia and has a new growth coming near the base an so will become a multi-stemmed plant over time. 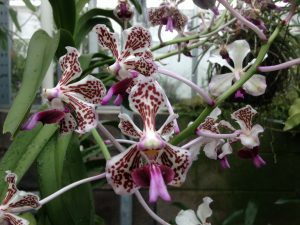 Some times this plant is listed as a separate species Vanda suavis and seperate from the other form of Vanda tricolor (also found in Java) which has fewer, rounder flowers, but we will follow theplantlist.org in our labelling.